The desk came from the home of a some nice people we met through Craigslist. It turns out the people who sold us the desk work in the film industry. As we were loading the desk into our pickup truck (and by this I mean David was loading and I was, well chatting) I mentioned I was writing a dissertation about 9/11 memorials. Turns out the seller of the desk had done editing work on a 9/11 documentary – Project Rebirth. 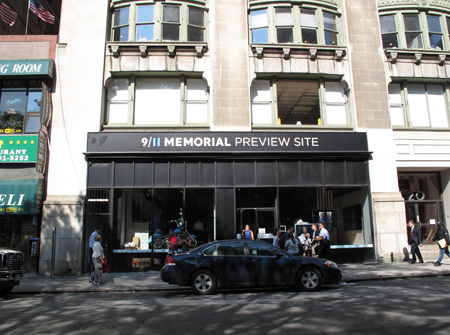 Coincidentally, I had just seen the trailer for Project Rebirth at the 9/11 Memorial Preview Site when I was in New York in September. Its an incredibly moving film that combines time lapse photography of the WTC site with the stories of nine people affected by 9/11 in different ways. The viewer sees the public WTC site physically rebuilt over time while simultaneously watching people reconstruct their personal lives after loss. Unfortunately, no trailer from an official source is available online, but I did find this YouTube post from a visitor to the Preview Site. These kinds of 9/11 related coincidences have been happening fairly often lately. Sometimes it’s someone I’ve never met before and our conversation is short and in passing, but their words always stay with me. I have also found myself speaking with a good friend I haven’t seen for a while and when 9/11 enters the conversation I realize there’s a deep, important part of our lives we’ve never discussed before. What surprises me is not the enormous number of people who have a connection to this subject matter, but how much both strangers and friends want to talk about it. As a country we’re still making sense of that day and the series of responses that followed. We haven’t owned the experience yet and perhaps that’s part of what these shrines and memorials are about – physically constructing and rearranging a narrative to make it our own. So there it is. I’m sitting at my new desk, looking at the small Statue of Liberty figurine I keep next to my computer, a gift from some of my NY teacher friends when I moved to LA. This feels right, sitting here sorting through images of shrines shot on slide film and hand scrawled writings in my journal – reconstructing the memory of those initial responses to tragedy and looking at them with fresh eyes nine years after that sunny fall in 2001. § One Response to Their words always stay with me. You are currently reading Their words always stay with me. at After 9/11.